Buzztime went big with our latest promotion…the all new Trivia for Cash competition! 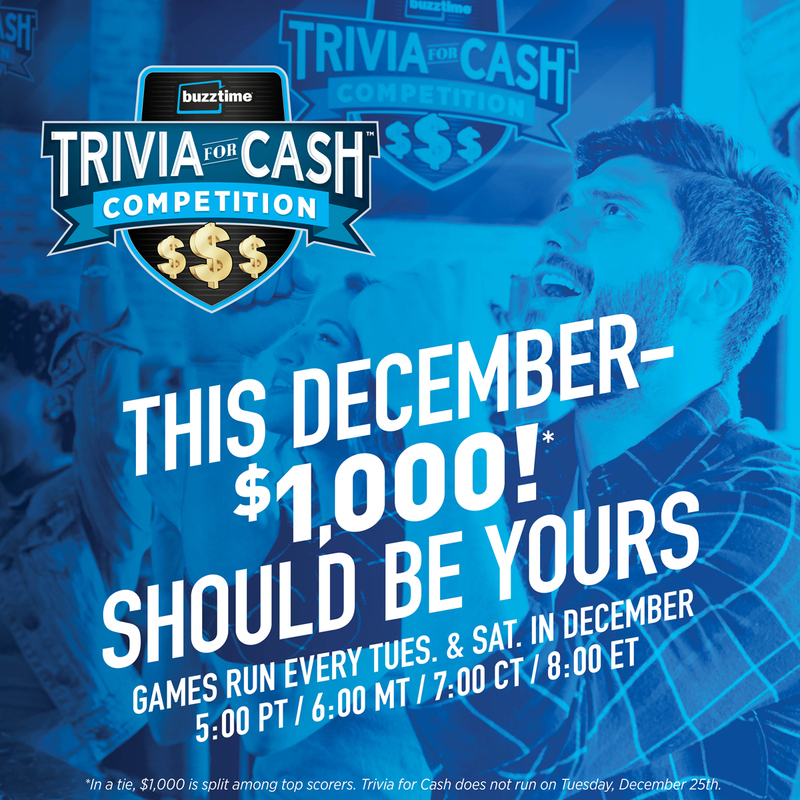 Every Saturday and Tuesday in December, registered players can compete in special editions of Countdown Trivia. The winner of each game scores $1,000. If there’s a tie? Those with the highest score split the prize. We’re already letting players know they can compete to win $1,000. Our marketing team is sending emails, running ads on TVs and Buzztime tablets, and promotion Trivia for Cash on social media. Join us in making some noise about this exciting competition. Use these 8 tips to build a buzz for your business: home of the first Trivia for Cash competition! With a chance to win $1,000, the competition is an exciting first-time experience for new players. It’s also the ideal time to boost your holiday foot traffic! To compete, customers must first register as a Buzztime player. Train your team to help patrons register – either on Buzztime tablets or by downloading the new Buzztime Entertainment app for Android and Apple devices. Remember, registration is free and fast! Trivia for Cash is built around 8 special rounds of Countdown Trivia. One of our most popular trivia titles, Countdown games run 7 days a week from 2pm until 10pm. 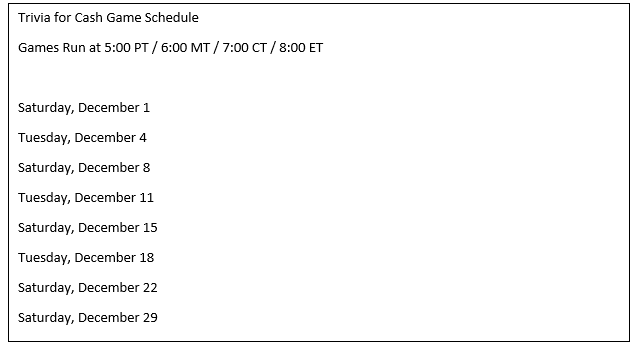 Why not hold “practice rounds” before the qualifying games of Countdown…or on the days leading up to a qualifying game? Longtime Buzztime players can show newbies their best Countdown secrets, and help them get registered so they’re ready to compete. Tip #2 – Let’s Get Social! Show your social media followers you’re aligned with this national trivia competition by tagging Buzztime. You’re welcome to share our Trivia for Cash social media posts! Visit Buzztime on Facebook, Twitter, and Instagram to find a graphic to share. Don’t forget hashtags! Use #TriviaforCash and #Buzztime. Tell guests to post their own photos and videos using #TriviaforCash #Buzztime and #YourBusinessName. Are you naughty…or nice? If you win $1,000 in @Buzztime #TriviaforCash, will you use the money for yourself or buy presents for others? Who doesn’t need extra cash for the holidays? 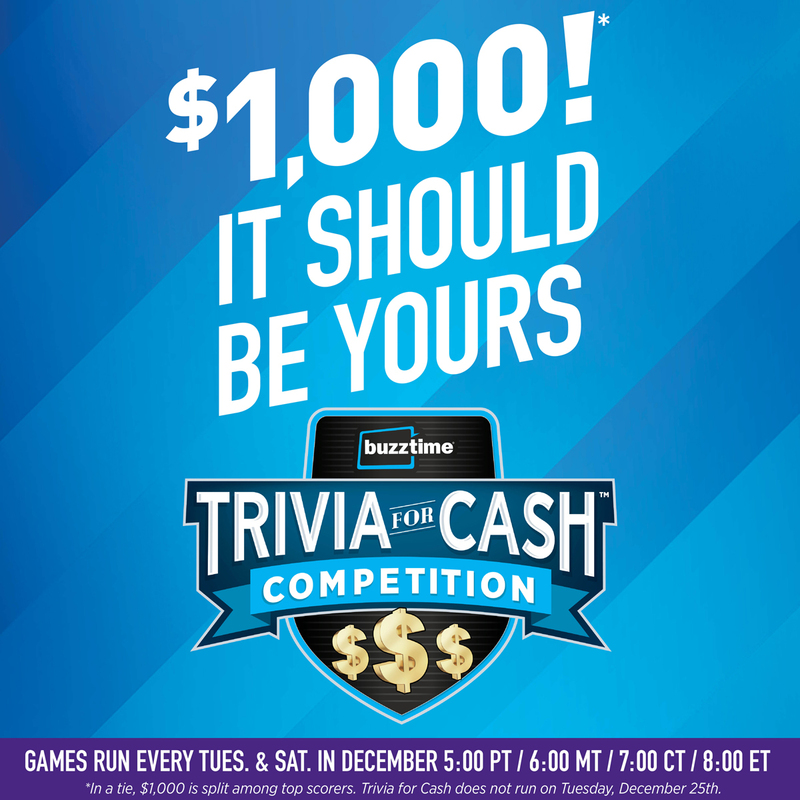 Compete in @Buzztime #TriviaforCash and tell us how you’d spend $1,000. Take a few minutes now to pre-post these graphics on Facebook. Schedule them to run every Saturday and Tuesday with a “Play Tonight!” message. Show off the fact your location is participating in a national trivia competition! Use the “Go Live” feature on Facebook and Instagram to live stream video and show those players at home what they’re missing. Live videos have a 6x greater engagement rate according to Mark Zuckerberg himself. Need tips on going live? Use this guide to live streaming. Give props to the smartest players! You can use Buzztime digital signage to congratulate the players with the highest scores in Trivia for Cash. Take photos of players competing and share ‘em on social media (just ask their permission first). 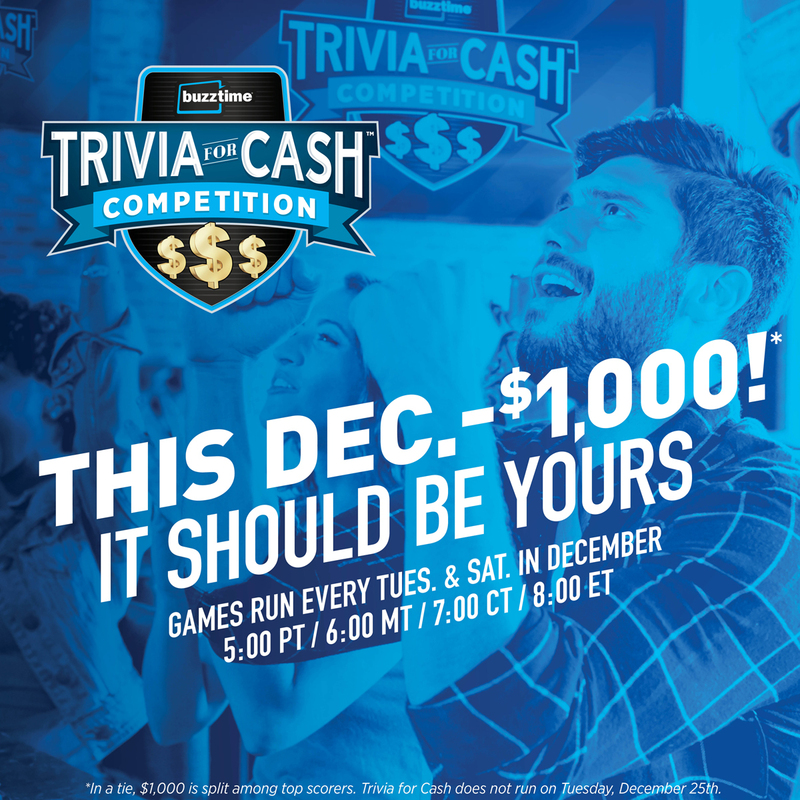 Spread a little holiday cheer and show love to your Trivia for Cash competitors! You could create a special menu of appetizer and drink deals that run around the time of the competition. Need ideas for festive cocktails? Check out this list of 25 merry and bright cocktail recipes. If one of your players earns a top score and wins a cash prize, make the most of it! It’s a great public relations opportunity. Create a press release announcing that one of your customers is one of the smartest trivia players in the country! Send your press release to local media and give the player plenty of shout outs on social media. Your winning player will feel like a VIP, and their social network will take notice of their accomplishment (and your venue). 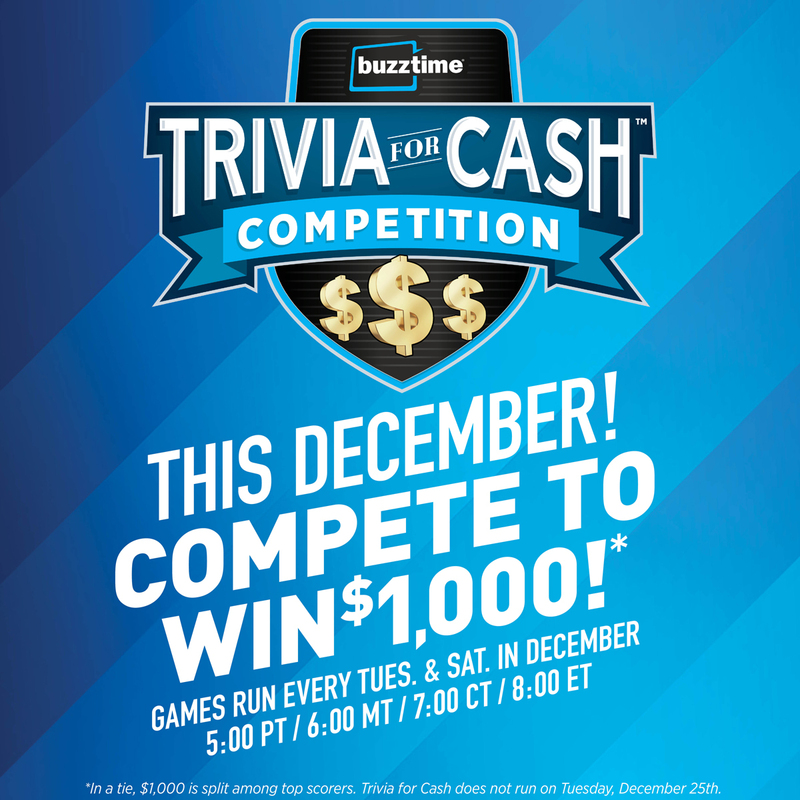 Buzztime is helping you end 2018 on a high note: by giving your customers a chance to show off their trivia skills and win $1,000 in Trivia for Cash!